As a way to ensure students get the most out of their educational experience, the House passed legislation that would remove the heavy focus on standardized testing as a requirement to graduate and instead allow students various options to show proficiency in pursuing their own career paths. Senate Bill 1095, which I voted for, would provide Pennsylvania students with additional options to fulfill high school graduation requirements beyond the Keystone Exams. Students who do not score proficient on the Keystone Exams would be able to demonstrate their readiness to graduate through alternative routes. 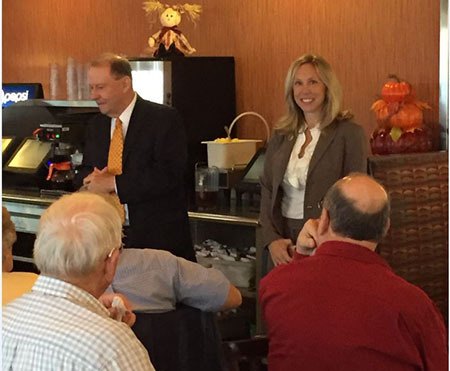 I want to thank everyone who attended my Farmers’ Breakfast at Baker’s Restaurant last week. There was a great turnout and I hope everyone learned more about the agricultural industry here in Pennsylvania. I also want to thank our keynote speaker, former secretary of the Pennsylvania Department of Agriculture and House Majority Leader Sam Hayes, for providing his insights on the industry. I recently released a column on why women should be treated as equals, not with special exceptions. Read a portion of it below and click here for the full column. “For the most part, growing up I was told I can become whatever I wanted if I set goals and worked hard to achieve them. There were, however, a few times I was told I couldn’t be this or that simply because I’m a female. “Of course, this mindset of women not being able to accomplish certain goals or hold certain careers is an abhorrent and antiquated belief. 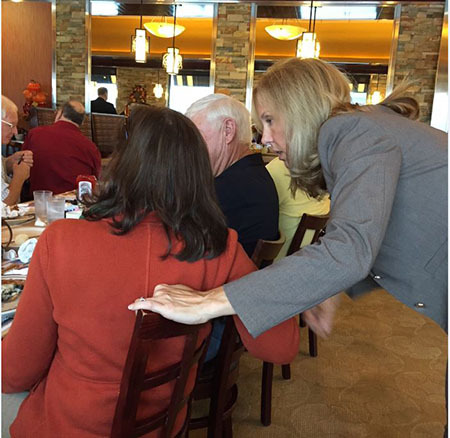 As a woman serving in the Pennsylvania House of Representatives, I can debate just as well as the men. “My path to the House was likely a familiar one for most legislators, including my male colleagues. I worked hard early in my life learning about the issues facing our state and I learned how state government operates. As the chief of staff for former state Rep. Will Gabig, I was constantly in the throes of ever-changing issues and policy development. When I decided to run for office, I faced two men in the primary. I didn’t ask for special treatment because I’m a woman, and, believe me, I sure didn’t receive preferential treatment from my opponents. In fact, I believe I fought harder because of my gender. 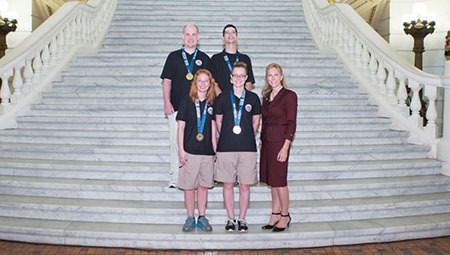 I had the privilege of welcoming Special Olympic athletes from York and Cumberland counties to the Capitol this past week. These athletes captured at least one medal during the national competition in Seattle in July. Way to go!! 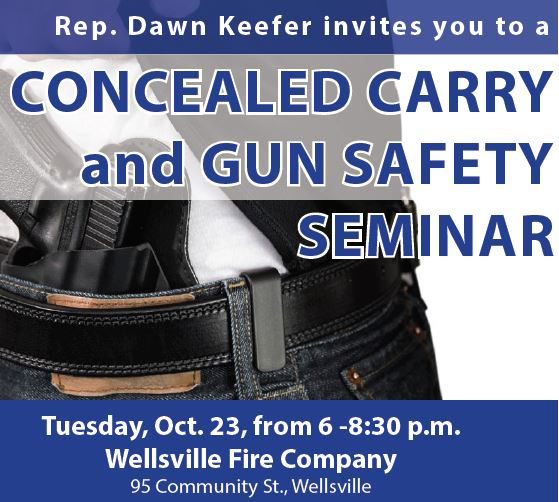 In an effort to better inform gun owners who live in the 92nd District regarding Pennsylvania’s firearm laws, I will host a free Concealed Carry Seminar at the Wellsville Fire Company, 95 Community St., from 6-8:30 p.m. on Tuesday, Oct. 23. Joining me to discuss Pennsylvania’s firearm laws will be attorney Matt Menges and a member of the state police. In addition to discussing firearms laws, the speakers will also talk about how to safely interact with law enforcement when carrying a firearm. There will also be a question-and-answer period so attendees can receive answers to questions they may have. Advanced registration to this free event is required. Those interested in attending should contact my office at (717) 432-0792 or go to RepKeefer.com to fill out a registration form. The deadline to register is Friday, Oct. 19.